Exchanging fiat currency for cryptocurrency is typically most people’s first step into the cryptocurrency world. It can be daunting when you are prepared to take the first step and you are presented with a wide variety of exchanges all offering different ways to exchange your fiat currency into cryptocurrency. There are different routes that can be taken when doing this. Some are simple and straightforward but may charge higher fees. Whereas others might be more complicated but you will get more cryptocurrency for your transaction. We delve into the best fiat to cryptocurrency exchanges in this article. We cover different angles and ways of exchanging so that readers can make the decision which option is best for them. We also present exchanges which support a wide variety of fiat currencies so that cryptocurrency enthusiasts from different regions are catered for. Coinbase is the leading exchange for a reason. The company makes it straightforward and simple to exchange your fiat currency for cryptocurrencies. Coinbase is an ideal exchange for beginners because the process is designed to simplify the complicated aspects of cryptocurrencies. Concepts such as wallets and the actual exchange process are designed to be easy-to-understand. Users can easily set up an account as they would on any standard website. 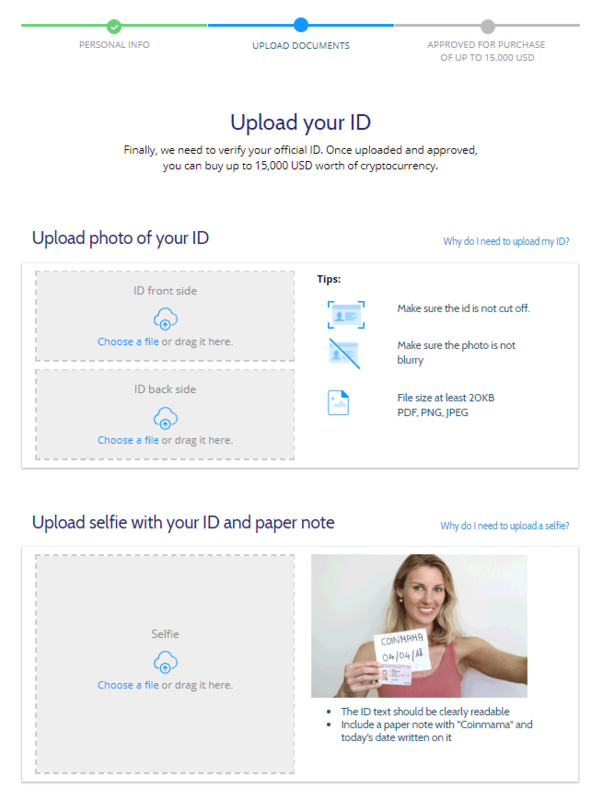 Coinbase has a strong emphasis on compliance with regulations so personal details will be required when signing up. You will also be asked to verify your identity. 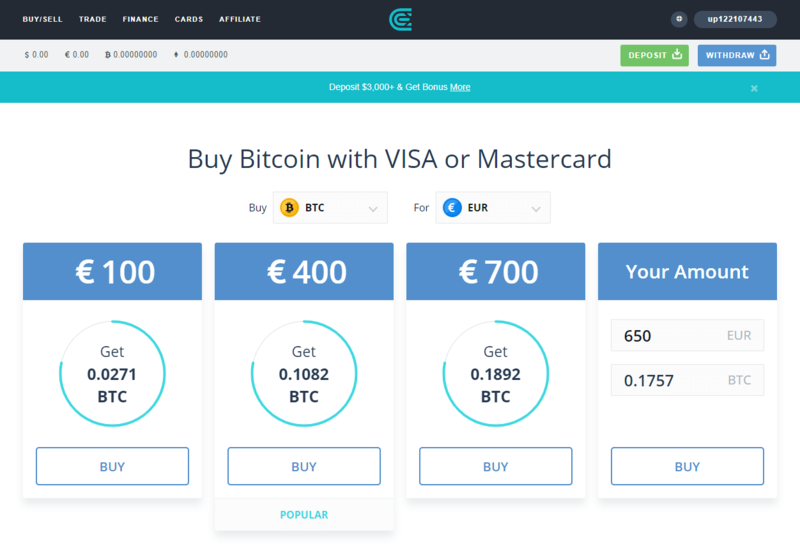 Users can choose to purchase cryptocurrency through a number of payment methods. 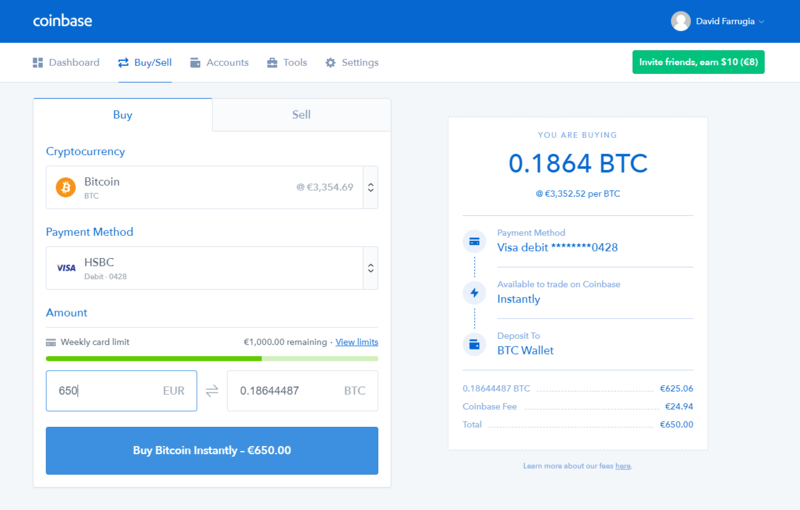 Users can deposit to their Coinbase account via banks transfers or wire transfer. Depositing through wire transfer or bank transfer takes a few days to arrive. There are fees applied on depositing and withdrawing depending on the method and jurisdiction. There is also the option to purchase with a debit or credit card. The option to purchase with a debit or credit card is an attractive feature which is not offered by many exchanges. It makes cryptocurrency accessible to people dealing in a variety of different local currencies. Despite the higher fees, Coinbase is the most popular exchange for a reason. It has a very secure wallet, the user interface is sublime, and everything is easy to understand. Coinbase has also recently launched the Coinbase Bundle where users can buy a basket of five cryptocurrencies that Coinbase supports in proportion to their market cap. The bundle includes Bitcoin, Bitcoin Cash, Ethereum, Ethereum Classic, and Litecoin. 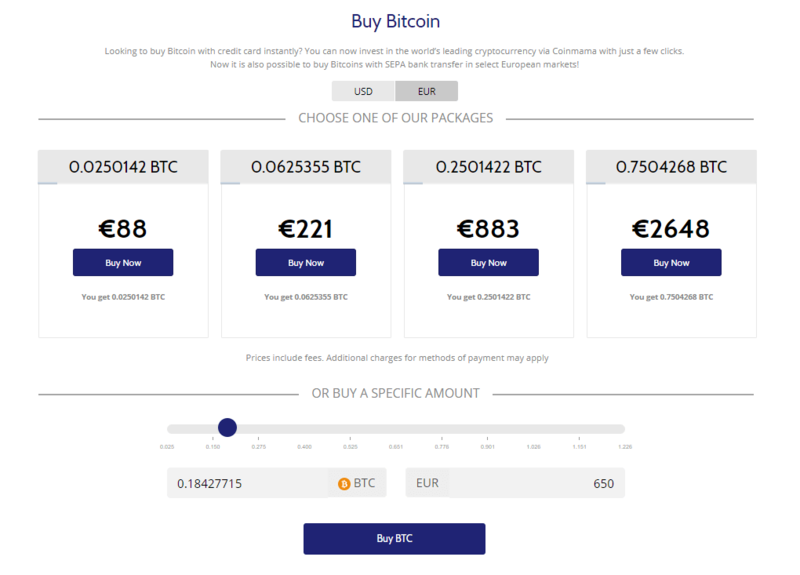 Coinmama provides a quick and easy way to buy cryptocurrencies straight from their homepage. Once an account is created, users are presented with options to buy different cryptocurrencies in specified amounts on the homepage. The cryptocurrencies offered include Bitcoin, Ethereum, Litecoin, Ripple, Cardano, Quantum, and Ethereum Classic. Users are quoted amounts for $100, $250, $1000, and $3000. It is also possible to customise the amount to be purchased. The quoted rate will adjust based on market movements. The quoted rate also includes CoinMama’s fee which equates to 5.9%. If users make the purchase with debit or credit card, a 5% payment processing fee will be additionally charged. The ability to purchase with a debit or credit card is an attractive feature for a lot of users as it enables them to invest in cryptocurrencies through a wide variety of local fiat currencies. Users will need to verify their account before making a purchase with either passport of national ID. Once verified, users can purchase up to $15,000 worth of cryptocurrency. Coinmama have also recently introduced the ability to deposit to the account via SEPA transfer which saves users paying the 5% payment processing fee. To learn more, visit our Coinamama review. A similar service but with options for advanced traders is CEX. CEX offers quoted rates in the same manner as Coinmama. Users are quoted amounts of cryptocurrency for $200, $500, and $1000 amounts. There is also a custom option. Users first have to set up an account before completing a purchase. Once users set up their account, they will be able to purchase cryptocurrencies with their debit or credit cards. There will be strict limits applied to how much they can buy but if they wish to extend their limits, they can choose to verify their account further. Supported cryptocurrencies include Bitcoin, Ethereum, Bitcoin Cash, Bitcoin Gold, Dash, Litecoin, Ripple, Zcash, and Stellar Lumens. The quoted amounts are recalculated every two minutes. Although this is the easiest option for the beginner, CEX does charge a 7% fee for this service which is included in the quote. If this purchase is completed through debit or credit card, there will be a further payment processing fee. Despite the fees being higher to use debit and credit cards, the ability to pay through this method is an attractive feature for a lot of users as it enables them to purchase in a wide variety of local fiat currencies. CEX also have a more advanced exchange where users can avail of lower trading fees along with margin trading. The margin trading enables users to go both short and long and also to apply leverage to their position. Although this is perfectly suitable for the beginner, it provides valuable features to the exchange. The fee schedule for trading on the more advanced exchange is much lower than the quick-purchase option and also highly competitive. Fees are lower for market makers which are traders that place limit orders that provide much-needed liquidity. Market takers are traders which take the best price possible at a given time and take away liquidity. Overall, CEX is a great exchange to consider for transferring fiat currency into cryptocurrency. It makes it straightforward for the beginner through the quoted amount option but also provides the features if the user wishes to do more advanced trading with their fiat currency. Other exchanges which provide high-quality professional trading platforms at competitive fees are both Kraken and Bitstamp. However, both of these do not have the easy system for buying through quoted rates which makes it easy for those starting out and that is why they did not make this list. OKCoin is an exchange which has been operating since 2013. OKCoin initially launched in China but due to China’s ban on cryptocurrencies, the business has been undergoing an expansion which has involved expanding operations to both North and South America. The company is still based in China but it is opening offices and developing a team all around the world. One of the main reasons OKCoin has made this list is due to this expansion. Not many exchanges facilitate for fiat currencies in South America but with this expansion, OKCoin will cater for fiat currencies such as the Argentine Pesos. OKCoin also has support for most major cryptocurrencies. This includes Bitcoin, Bitcoin Cash, Ethereum, Ethereum Classic, and Litecoin among more. Users are also provided with a range of professional tools. This includes a price chart, order book, and recent trades printing. Users also have some technical analysis tools that they can use. The exchange has some of the largest volumes making it highly liquid. 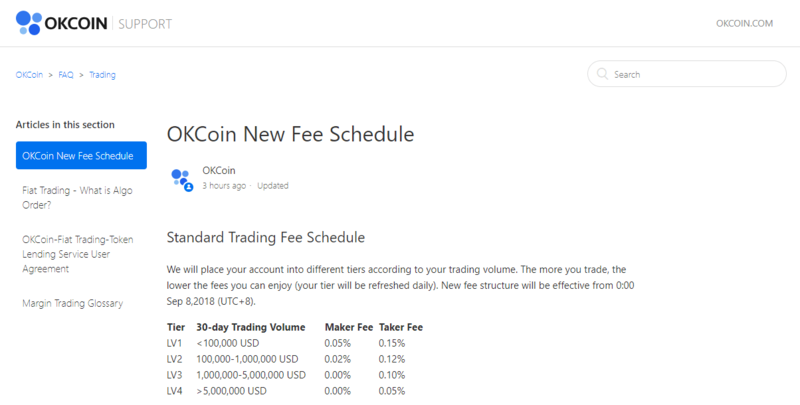 OKCoin has some of the most competitive fees in fiat cryptocurrency trading. There are no fees for either deposits or withdrawals. Fees for trades get progressively lower based on the volume traded and are lower than most even from the highest tier. One of the key limitations of OKCoin is that they have not yet expanded into providing trading for the Euro. Its expansion into South America puts it into a unique position in terms of supporting fiat currencies. The tools provided, competitive fees, and high liquidity all make it a strong exchange to consider for exchanging from fiat into cryptocurrency. OKCoin also has a strong focus on regulation adding to its credibility. Bittrex was for a long time the main player in the field of crypto-to-crypto. They recently began supporting fiat currency which made them a contender for this list. The main selling point of Bittrex is the sheer amount of altcoins available. There are over 500 altcoins available to be traded against Bitcoin. Fiat trading pair options will be rolled out slower and currently, there are only 20 options available to be traded against USD. Despite the limited amount, using fiat to transfer into Bitcoin opens investors up to the over 500 pairs available to be traded with Bitcoin on Bittrex. Similar to OKCoin, Bittrex also provides a range of professional tools to assist in trading. Traders have access to a price chart, an order book, a depth chart, and trades printing. Users also have some technical analysis tools which they can apply. All trades incur a 0.25% fee which is highly competitive. Bittrex is not regulated which provides an additional risk to users. While exchanges like Coinbase are regulated and have consumer protection laws governing their operations, Bittrex do not provide this safety net to investors. However, with Bittrex operating since 2014, it has built a trustworthy reputation and ranks highly among exchanges. The main benefits include the wide variety of altcoins supported, the fiat currency support recently added, and the low trading fees.